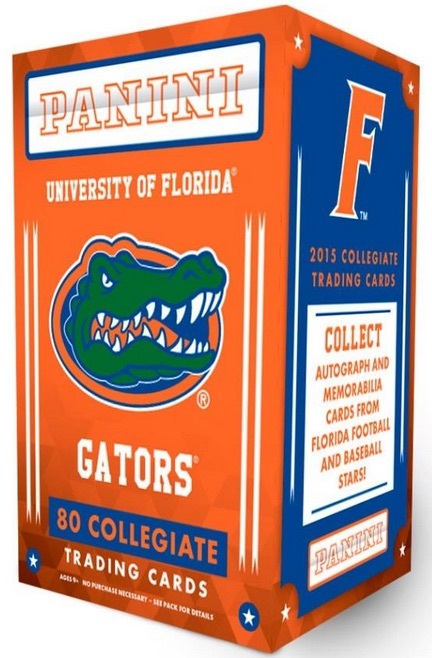 Concentrating on the University of Florida, 2015 Panini Florida Gators Collegiate delves into the athletic history found in Gainesville. The multi-sport release includes at least one autograph or memorabilia card per box. Taking a deep look at the former Gators across multiple sports, the 85-card base set is filled with many notable names. Top football options include Tim Tebow, Emmitt Smith, Percy Harvin, Dante Fowler Jr., D.J. Humphries and Matt Jones. Basketball is represented by Al Horford, Chandler Parsons, Bradley Beal and Michael Frazier II. Also in the mix, former baseball stars include Paco Rodriquez and Richie Martin. Centered around the football and baseball players, Signatures are the primary hit and include parallels numbered to 99 or less. Memorabilia cards are also randomly found. Documenting the true standouts of the athletic program, Honors features the award-winning Gators, specifically those named the SEC Player of the Year or Maxwell Award winner. Parallels add to the base and insert sets in the form of Silver, Gold and Black. MATT JONES 2015 PRESTIGE ROOKIE PRIME 3 COLOR GU JERSEY PATCH RC 100!! GATORS!! 2015 CLEAR VISION CLEAR HISTORY PERCY HARVIN DUAL 2CLR JERSEY PATCH 99! GATORS!